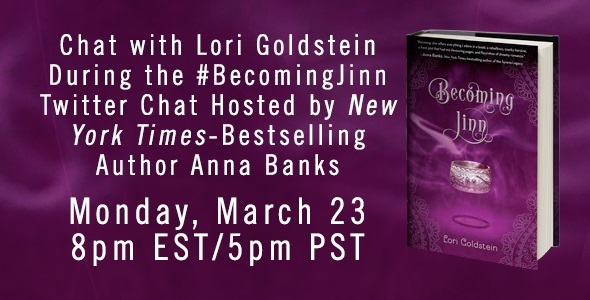 Monday night, Anna Banks will be conducting a Twitter Chat with Lori Goldstein to promote Becoming Jinn. It will be at 8 pm EST on Monday, March 23. There will be tons of prizes, including free books, for those who participate! Follow Lori Goldstein on Twitter (@loriagoldstein). Follow Anna Banks on Twitter (@byannabanks). Follow the Twitter Chat with the hashtag #BecomingJinn.